It only takes one night with Ash Gallagher to make Eli Hollister think he’s finally met the right man at the right time. Good thing he doesn’t bet on it, because Ash turns out to be a student in Eli’s class at the local college. Eli can’t deny he’s attracted, but now it’s complicated. He’s already in enough trouble with the department head, a man who would like to see Eli denied his tenure and fired. Ash is looking forward to taking his life in a new direction. After serving one active-duty stint in the Marine Corps and another in the Reserves, he’s ready to put his military life behind him. The last new experience he’d planned for this semester was to fall in lust with his English professor, but the more Eli resists, the more Ash is determined to have him. Then he discovers Eli’s playing for keeps, and Ash is only interested in a fling… or is he? Between these two, when it comes to life and love, all bets are off. I was lucky enough to meet the author at a recent real-life get together of an online group, so when All Bets Are Off showed up as a review copy on Netgalley and since I had never read anything by this author, I jumped at the chance to read something by her. One of my favorite tropes in books is the forbidden student/teacher relationship, but they are so often hard to find in a way that seems believable. 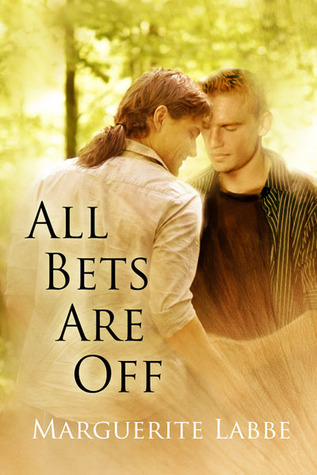 That is one of the things that I loved about All Bets Were Off, the trying to avoid the relationship and the building of sexual tension through-out rather than a quick fling. The bantering between Ash and Eli was probably one of my favorite parts of the book, especially since they supported different sports teams. It made it seem more real than many relationships in books that just seem forced. The relationship between Ash and his Marine buddies was the other part of the story that I enjoyed – you could tell that the author had really done her research. Being in the military, I am very picky about how the military is portrayed, and I felt that the author did the relationships justice. I did feel that between the mystery and the freaky department chair, that there was too much going on which took away from the developing romance. I kind of wish that just one of those elements had been focused on vice both of them. But that is just a small complaint. I do know that I will definitely reading more books by the author in the future.